As mentioned in my last entry, olive oil is produced early in Tuscany. This weekend I was able to join my boyfriend's family for the pressing of their olive oil. Their farm is about 6 acres, located about 350 meters above sea level just outside the Chianti Rufina and Pomino growing areas. Leccino, Moraiolo and Frantoio olives from the Bernini farm. 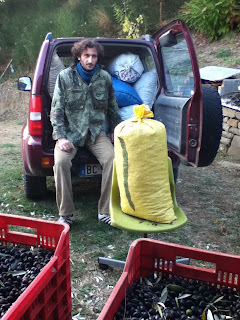 Saturday afternoon, we moved all the olives from ventilated crates into large sacks to haul them off to the frantoio where they are pressed into fruity, green, peppery extra virgin olive oil. Gionni taking a break after lots of lifting. "Camperiti, which means campi ritti or campi ripidi, steep fields, has always been the heart of our oil production, in addition to being the residence of our family until moving into the city of Florence in 1975... Camperiti has always been considered a special place which produces high quality olive oil. The proof is in the many clients who return to us each year to press their olives, as well as the many requests we are not able to fulfill due to the demand for our press." "Until about 40 years ago, most farms had their own olive press... In the early 80's M.se Vittorio began sending all the olives from the surrounding area to Camperiti for pressing, while the Val di Pesa continued to use their own press... In 1984, the frantoio was updated to the continuous press system, which further increased the quality of their press and as a result Camperiti became the exclusive frantoio used by the Frescobaldi farms." So, you know, everyday Tuscan stuff. Counts and other Nobles are plentiful in these parts. How were we able to use this sought-after press? Gionni works at a winery that has pressed their olives at Camperiti for decades. In Italy, knowing the right person will usually get you places! This was no exception. Our appointment at the Camperiti frantoio was for 6:30pm. We arrived at 6:20 and parked our car on the large scale outside. The scale first weighed the car filled with olives. After the olives were dumped into a large vat, the emptied car was weighed again. Our olives came to a total of 78 kilos. After this stage, we headed downstairs into a large, noisy room filled with the aroma of freshly pressed olives. 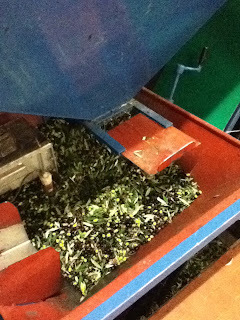 The machines were busy at work, pressing over 3000 kilos of olives brought in by the 6pm appointment before us. The man with 3000 kilos of olives! Since it took a while (it felt like an eternity!) for his oil to be pressed, we killed time in a side room where we were offered roasted marroni, large delicious chestnuts. First, the olives were sorted (removing leaves, stems and any foreign objects) and rinsed. After rinsing, the olives rode up a large belt to be made into a thick, brown paste. The paste was then pressed, extracting the green olive oil. Large Inox Stainless Steel containers (see above and below photos) are used to store olive oil. What is not shown here in my photos? Us in the side room dipping bread into our new oil. This is my favorite tradition and always satisfying after a long day in the olive groves. This oil is one of the best I've had from the Bernini farm. It has a nice peppery finish, with a bitter kick much like a fresh cut artichoke. There is no bad way to eat this olive oil, but best not heat it up too much, since it is super delicate (only about .15% of fatty acids). 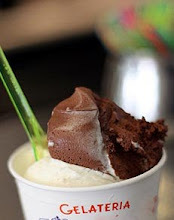 A quick and easy recipe- and a classic! Slice and toast/grill unsalted, crusty bread (about 1cm thick per slice). Drown slices with new oil. If you like, add garlic by rubbing a raw clove of garlic over the bread. Fettunta literally translates to the oily slice. Don't be shy when pouring on your Tuscan oil! (The order of when you add oil, salt & pepper depends on who you ask. I sprinkle the salt, then add oil, then rub garlic. If you prefer stronger garlic presence, rub garlic on the bread before you add the oil. Remember Dr. Seuss' Butter Battle Book? Locals are equally opinionated on the order of salting and dressing your fettunta, salad, etc. Special thanks to the Frescobaldi family and Luisa at the Il Quartino tasting room for their help! Thanks! I'll be dousing everything in it now!